As I mentioned in a previous post, I have recently moved my studio. For me, as for many artists, moving studios is a hugely disruptive process. 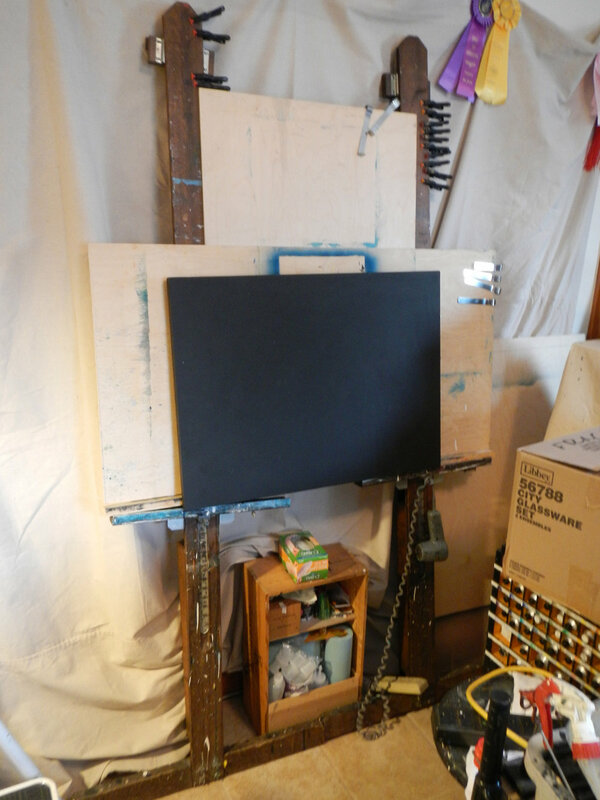 But if you are moving or even setting up a studio for the first time, following are some simple tips for setting up a painting studio that I have found helpful over the years. A little planning can make a studio more efficient, especially if you are trying to save space. To be clear: This is not a traditional, North-facing, dust-free, smock and beret type of painting studio. This is a down and dirty, artificially lit, paint-into-the-wee-hours, garret type, art workshop. Yours may be something altogether different. So, the first thing to do is to get organized and pack-up your old studio. If you are renting and/or want to protect the new digs you're in, I recommend two things: linoleum and canvas. Once you're through enjoying the heady environment of the empty room you are about to fill up and create in, go to your local flooring supplier (or big-box home improvement store) and find the cheapest slice of roll-up linoleum you can. Remnants even work for small studios, though it's preferable to find something with a fake "tile" grid on it rather than a random seamless design — more on this in a minute. Don't worry about adhesive, this is something you are laying down over a nice floor to protect it. Gravity and furniture will hold it in place. Nice hard-wood floors want protection from paint and solvents. Rolled flooring tends to keep it's curl for a while and that can be a danger to feet. A heavy road-case or other ample weight, set overnight, can make things lie flat. I found a reasonably priced vinyl flooring with a 12x12" tile pattern on it which covered the working area of the room. Measuring beforehand is important here to properly cover your work area, and you may have to cut away areas that cover ventilation or other outlets. Next, you'll want to protect walls. Years ago, I started doing this by hanging a canvas drop-cloth on the wall behind the easel in my studio. I just slammed a bunch of 5/8" push pins into the wall to accomplish this then, but over time I've gotten more sophisticated. My current lease actually has a clause that I can only use gallery hooks in the walls like the one illustrated here. This is reasonable, as the walls are plaster and lath and can be difficult to repair. In fact, not only have I already been using gallery hooks for years now, I recommend them even for drywall. 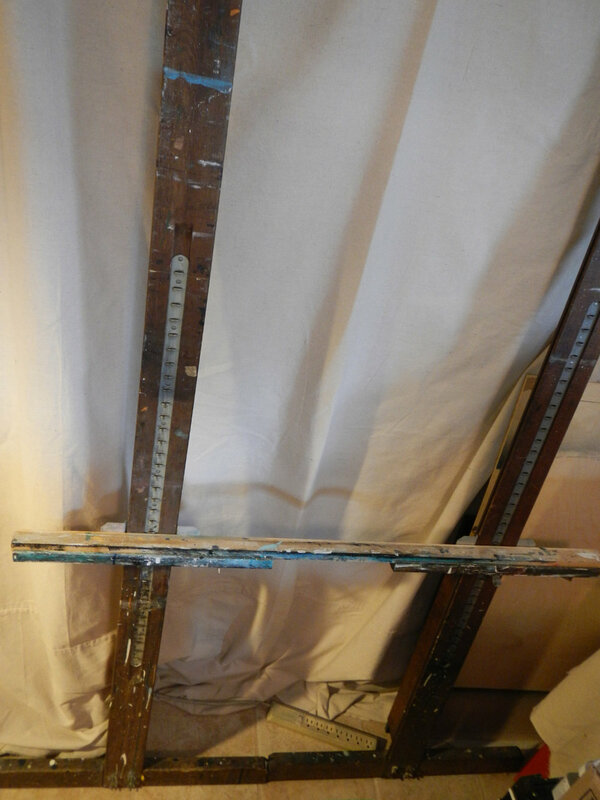 So while you're at the local big-box, get some gallery hooks, a large canvas drop-cloth (measure! ), and a grommet kit — 1/2" grommets should do (and a hammer if you don't have one already). At this point with the flooring, you probably have spent about $70 to $100. Unfold the drop-cloth and mark even spaces to apply your grommets along the top (yup, more measuring). These will need to match where you place the hooks on the wall. However, you don't have to go crazy trying to get this exact — the canvas need not hang too tightly. As long as the spaces between the grommets are wider than the spaces between the hooks on the wall by at least an inch to give the drop-cloth a little slack, you should be fine. Also, place the hooks at a height so you have excess canvas where the wall meets the floor (to accommodate things like power cords). It's a good idea to fold the top 2 inches over to provide a little extra strength as you cut the holes. The hole-cutters that come with most grommet kits dull quickly, so you may want to have a pair of sewing scissors or a razor knife at the ready to perfect the holes before you pound in the grommets. Follow the instructions in the grommet kit to match up the grommets and their dies, and give 'em a good healthy whack. It's a good idea to sacrifice a grommet or two to practice before committing the rest of them to your project (to see how they work). Once your grommets and hooks are in place, the canvas can be hung to protect the walls from even the most Jackson Pollock-like projects. In this case I was covering an 8' wall, so I hung 5 hooks with 24" between each one. Next comes the easel (if you paint on an easel). I acquired two easels from an art-teacher-aunt back in the nineties. I save space by not unfolding the rear supporting leg and simply lean them up against the (now protected) wall. ...and place a board between them. A slice of thin plywood backs up the artwork. 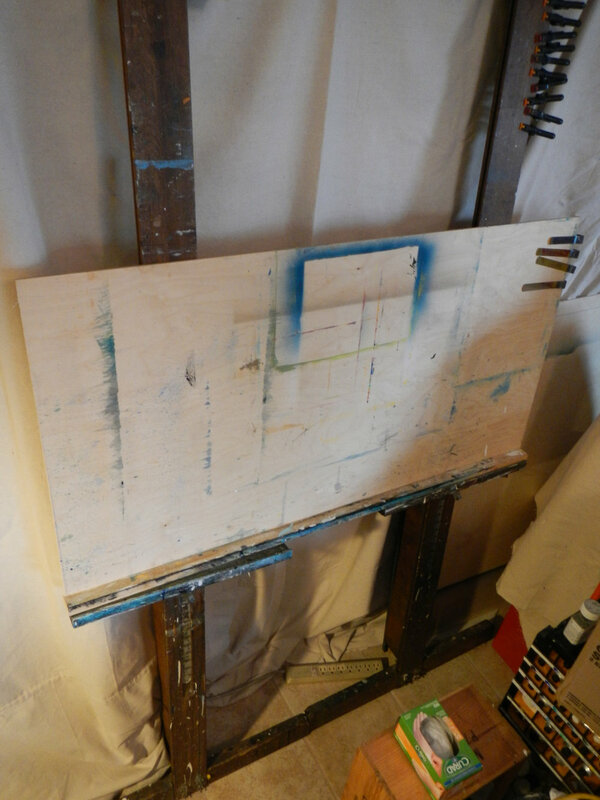 All together, it makes a cheap but sturdy easel. Today these easels run about $200 a piece (new). But save some money, and look on Craigslist or eBay... or lash some lumber together to your liking. There are many possibilities for cheap easels, and you're probably going to drip paint on them anyway. Now you have a place to work. Huzzah!! However, what about photographing the work you finish? That's where the fake "tile" pattern comes in really handy. It's a grid! To photograph a piece of art you'll want to place bright lights on either side of the work between 30 and 45 degrees perpendicular to the face of the work for even, glare-free lighting. If you set the center of your easel along one of the tile lines you can simply place your light stands at the corners of your tile-grid, as illustrated below. 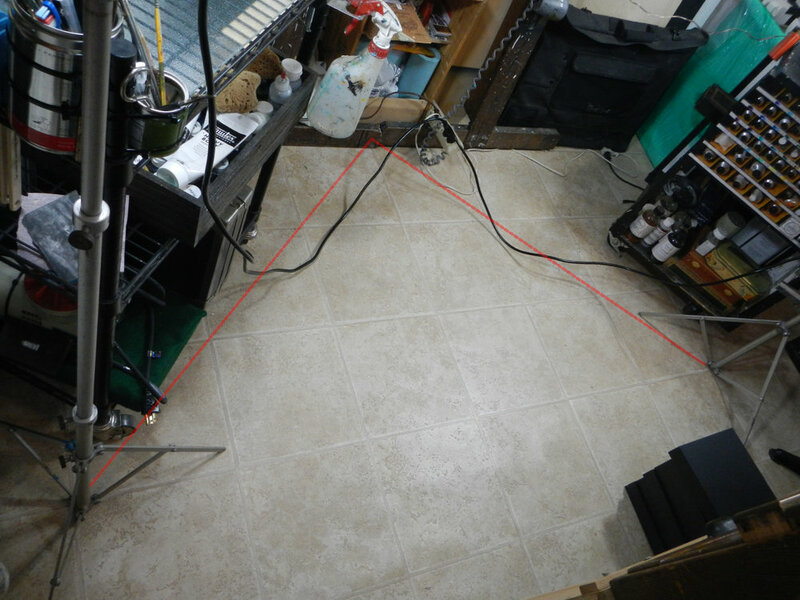 You can also use that center-line under your easel to center the base of your tripod when you set up your camera. I don't have my photo-floods out all the time, but the grid makes it easier to set up when I need to shoot. Red line shows 45 degrees. Still too much glare? Move the lamps back towards 30 degrees. I use 5K lamps and set the white point with a playing card — the ace of spades or ace of clubs will do nicely. With the bonus addition of my two Luxos (set around 30 degrees), these work lights (set at 45 degrees) provide ample light. One final but important note: I put as much of my studio furniture on casters as I can. This helps make my studio flexible to different sorts of projects. I hope this helps make your studio setup a little more efficient. Packing and moving is a hassle for everyone, but it can result in a disruptive break in the creative process for artists. Better to treat it as an opportunity and re-create the studio itself!